I was exploring the newly announced Google Drive cloud based storage and collaboration platform. I went back to my Microsoft SkyDrive account to write an article on how to compare Google Drive with Microsoft SkyDrive. Microsoft has not given any definition for what is loyal customer, but I assume all it means is you already have a Microsoft SkyDrive account. 1. Login to your SkyDrive account. 2. Click on "Manage storage" link at the left bottom. 3. Look for the "Free Upgrade" button and click on it. Congratulations! You have upgraded your SkyDrive account to free 25 GB storage space at the cloud. Enjoy a lot of free cloud storage at SkyDrive. 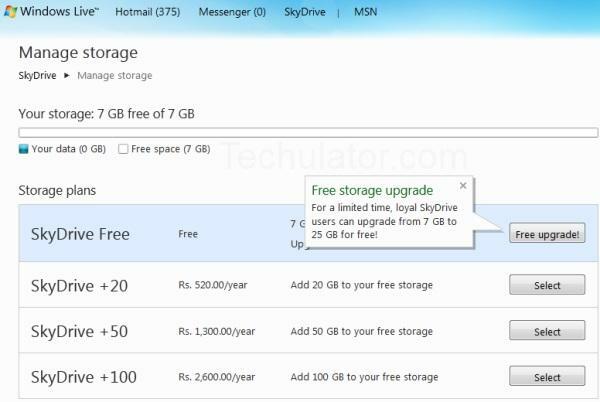 As of now, Microsoft SkyDrive offers the highest free storage capacity among the popular cloud storage services. Do you want to change the root folder of Microsoft SkyDrive (OneDrive)? Read the step by step instructions to change the root folder location of SyDrive.